The original Papa Palheta at Bukit Timah Road may have closed, but for those of us who miss the staff, the quiet courtyard, and the room that could have been from any city in any era, echoes and traces remain in a quiet cafe in a park by a river. Parts of it are still there, just slightly different than before. With songs from the 50's in the background, and old recycled wood given a new lease of life as tables and bar counters, Loysel's Toy in some respects resembles it's younger sibling, Chye Seng Huat Hardware. 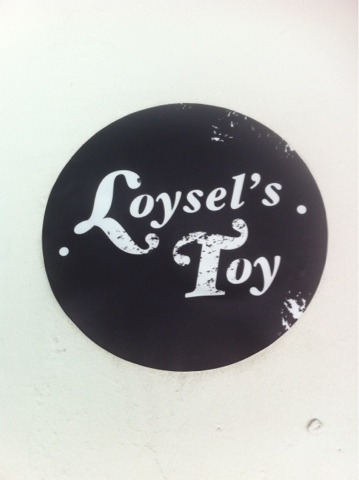 Loysel's Toy differs in that it has it's own identity, as a quiet haven in a riverside park. The busy interior section bustles with staff carrying coffees back and forth, with the cadence of conversations interrupted by the hiss of milk being steamed. Outside, the traffic and the city seem far away, as leaves rustle in in the breeze. Loysel's Toy can be seen as an evolution of Papa Palheta. Papa Palheta was a coffee boutique, while Loysel's Toy was a full service cafe from it's very beginning. Some of the original concepts remain - a food menu which caters to what can be done well - but some new ideas have emerged over the years which have worked well. One is the bike rental option, which cleverly takes advantage of the riverside location. 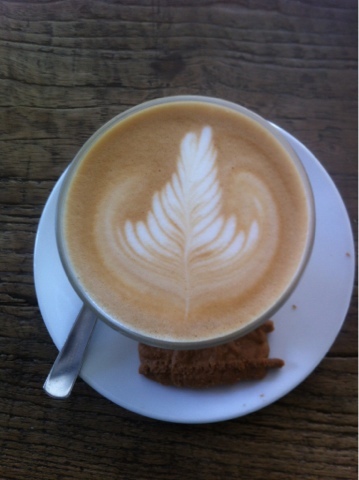 The most important part of any cafe is the quality of coffee, and regardless of location, this can make or break a cafe. 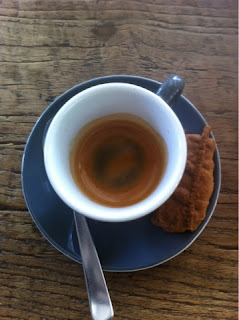 The espresso shot that I ordered consisted of a small volume of coffee, covered by a layer of medium dark brown crema. There was no bitterness evident, just a burst of robust, full bodied coffee, with hints of blackberry-like flavour present also. The potency never gave rise to burnt flavours - something that I have seen before in other cafes. This tells me that the roasting process has been very carefully controlled, and calibrated to bring out specific flavour elements in the coffee beans used. The mouthfeel is thicker than shots in other cafes, and tells me that the extraction time is right where it should be - not too long, bringing out bitterness, and not too short, leaving out some of the best parts of the ground coffee. It reminded me a lot of the espresso shots in the original Papa Palheta on Bukit Timah road, which remain as some of the best espresso shots that I have had in any city or country that I've been to. It's worth noting also that the water used in Loysel's Toy goes through an elaborate filtration process. It's an interesting touch that I don't see in every cafe, and speaks of the attention to detail, and the commitment to quality coffee, that was evident in the original Papa Palheta, and remains in Chye Seng Huat Hardware. Lattes and milk based drinks in Loysel's Toy are single shot drinks. This is stated on the menu, and the option to add extra shots is available. This is certainly recommend, as the latte that I ordered was quite pale, and the robust espresso character above was lost, with milk as the dominant flavour. I added an extra espresso shot to the mix, and the difference was very, very evident. The potency was restored, but tempered by the milk, rather than being lost. Combined with the velvety smooth foam, and finished with some well executed latte art, the double shot latte combined the best elements of texture and flavour. 50 mls of fluid is a small volume of coffee, but it's sufficient to turn a very mild latte into a very good one indeed. The coffee menu is exactly as expected - a good combination of espresso, milk based drinks, and brewed and filtered coffees. The addition of Chye Seng Huat Hardware has seen the coffee roaster move to Tyrwhitt Road, and the resulting space has been put to the good use with the addition of a brew bar. This allows for a variety of brewing methods to be catered for. A retail section is present also, with a mixture of coffee beans, keep cups, paper and chemex filters available. The retail section is smaller than Chye Seng Huat Hardware however, and does not contain the same extensive selection of items. There were two different coffee blends available when I visited - the original Terra Firma blend, and the 1000 cups blend. Both are robust, but differ slightly in the levels of acidity evident in each. It may be slightly out of the way, but the cafe in the park by the river is definitely worth visiting.